I’ve just managed to get hold of a new book of photographs of Brownhills. 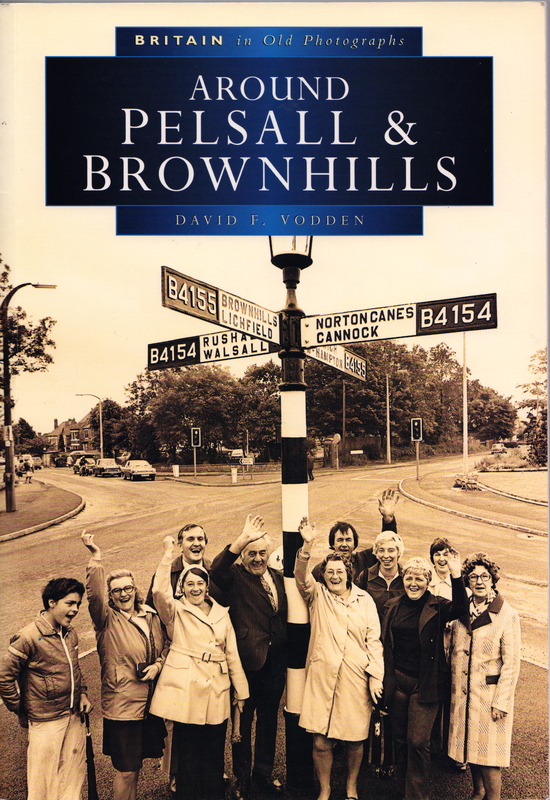 Entitled ”Around Pelsall & Brownhills’ it’s part of the huge ‘Britain in old photographs’ series, compiled by David F. Vodden and published by Sutton Publishing Limited (128 pages, 1998, ISBN 0-7509-1898-5). It’s a book I’d noted the existence of, but never opened. I wished I’d done so previously, as it’s a genuine treasury of historic photos of our area, both the old and more recent. I shall certainly be dipping into it here on the blog for some time to come, as so many of the pictures are new to me, and very thought provoking. It’s a fantastic tome, only slightly dimmed by the presence of photos of our neighbours in Pelsall. The reproduction isn’t the best I’ve seen, but the book contains contributions from a wide range of local notables including Doug Birch, Brian Rollins and Walsall Local History Centre. If you can find a copy, I recommend you purchase one immediately, you’ll love it; however, like many of the great local history books one suspects the print run was rather limited and they’re very scarce in the wild. Coming up there’s going to be quite a lot of local history here on the blog, so please do stay tuned, I’ve a ton of great stuff to share. Did you know any of these brave men? I love the slifghtly raffish, relaxed C. Mason. From 'Around Pelsall & Brownhills' by David F. Vodden. Reader 'Howmuch' remembers this old General Store, and the Chippy a few doors up. Note the signs for Bournville, Fry's Cocoa and Colman's Starch. I also like the gum machine on the wall to the left. 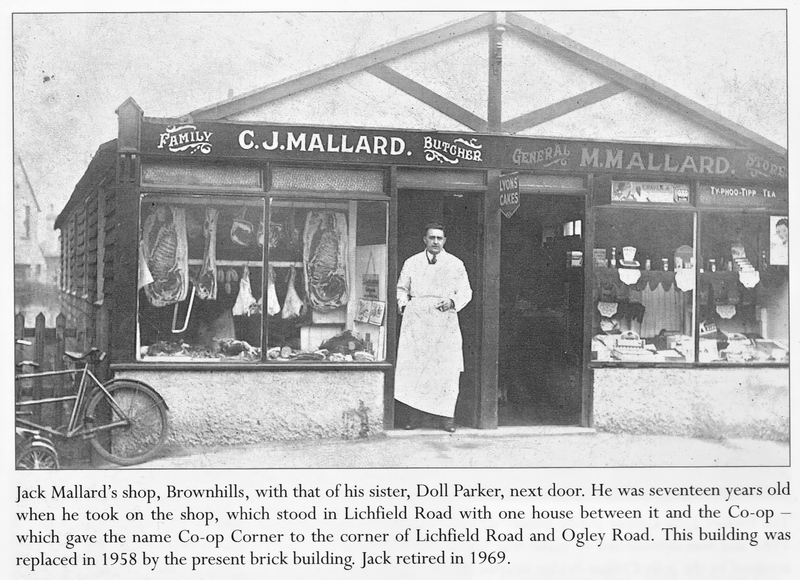 From 'Around Pelsall & Brownhills' by David F. Vodden. Another store I never knew exised. Note the cigarette, bike with Brooks saddle and hacksaw hanging in the window. From 'Around Pelsall & Brownhills' by David F. Vodden. Get a copy if you can. Wonderful stuff. 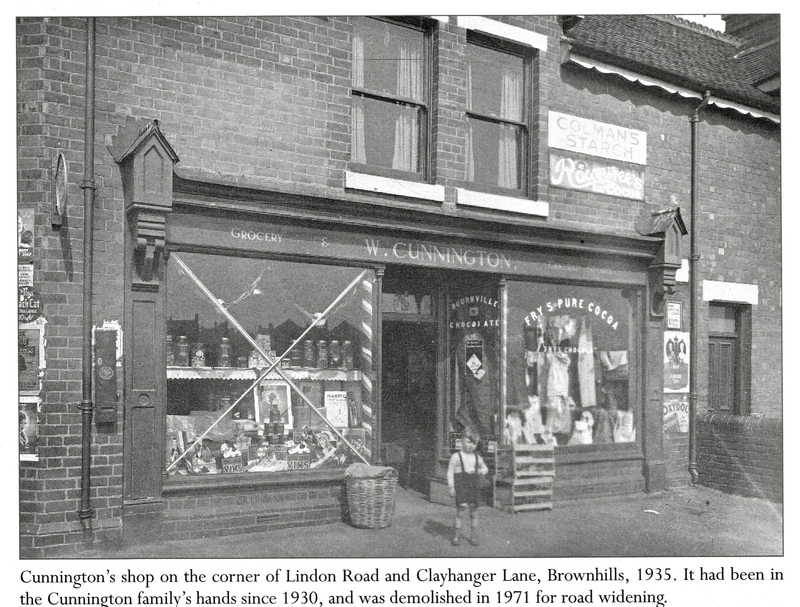 This entry was posted in Brownhills stuff, Environment, Fun stuff to see and do, Interesting photos, Local History, Local media, Shared media, Shared memories, Spotted whilst browsing the web, Walsall Wood stuff and tagged Around Pelsall & Brownhills, Britain in old photographs, Brownhills, Brownhills local history, Clayhanger, Cunningtons, David F. Vodden, Doug Birch, Local History, Mallard, New Photos, Pelsall, Shire Oak, Staffordshire, Walsall Wood, Walsall Wood Colliery, Walsall Wood Pit. Bookmark the permalink. Was brought up in Pelsall from 1960 – 1987, then lived in Brownhills, on and off to this day. I will find a copy, thanks for bringing it to my attention. I remember cunningtons shop. must have only been around 6yrs old. clearly remember the pull-down yellow sun reflectors in the windows. Brilliant stuff…! 🙂 I will definately be ordering a copy..! Thanks very much. l particularly like the ‘tram’ photos of walsall wood in the book and ‘the regent’ picture house in Brownhills. Great tip Bob, thanks. I’m sure many people will recognise various faces on the book’s cover, but the only one I’m sure of is Sim Mayou, at the back and raising a grubby, hard-working hand. King Simmy seems to have had a hand in so much in Pelsall over the years, and I love going into his hardware shop on Norton Road, now run by his son, where they’re rarely stuck for stuff you might need. It’s like an Aladdin’s Cave crossed with the Tardis. I was a boy when I lived across from Cunningtons, at 105 Linden Road ,in the late 50s.On Saturdays I took a list for groceries and was usually served by a young lady Rita Kelly who I belive married about that time. I hope this may bring afew memorys back to some of your readers. Recently I came across the new glimpse into the past posted 4th September 2010. 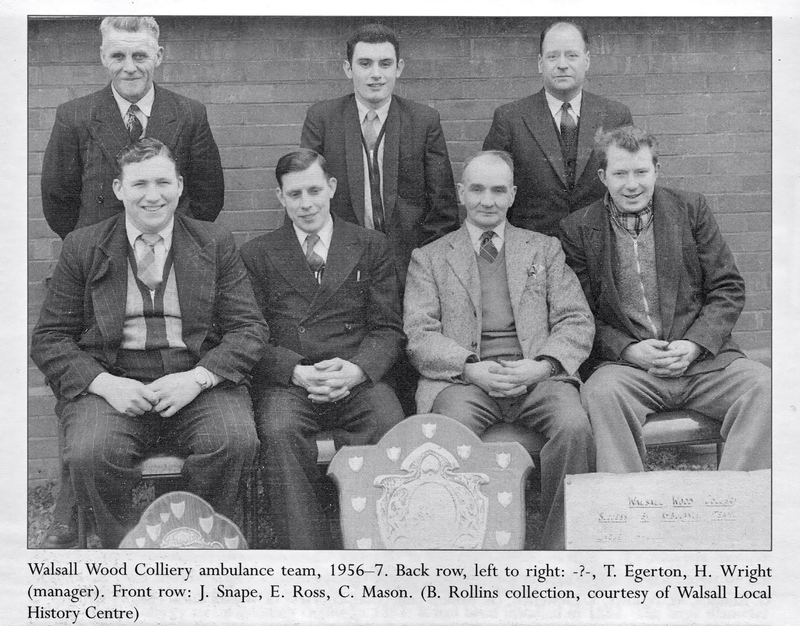 On the photograph of the Walsall Wood colliery ambulance team, the ‘slightly raffish relaxed C. Mason’ is Gordon Mason currently living at 12A, Salters Road, Walsall Wood. The incorrect initial C would derive from his nick-name “Copper” which arose from the colour of his hair in his youth.